Finally last August 18 to 21, 2016, after the much awaited grand combined orientation event of LPGN for Laminine Food Supplement, it was a weekend to remember. Thanks to Gold IBO Dr. Michael Pounder and Platinum IBOs Pastor Garth Sinnette and Stanley Hoyte who successfully handled the event. 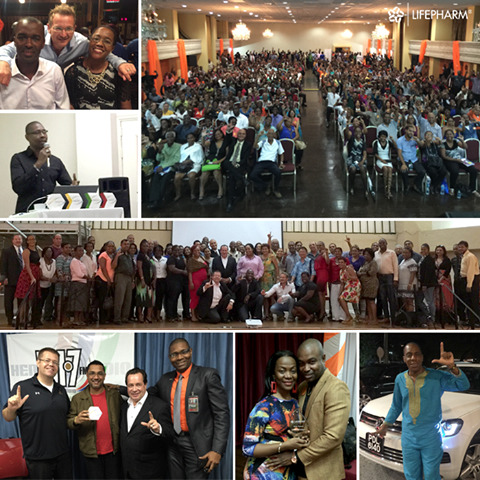 The three LifePharm® leaders hosted these two events in Trinidad with a combined guest list of over 1,000 attendees. LifePharm Corporate team members Dr. Edward Andujar, Steve Brown, Tyler Sharp and Sonya Olivas, and Platinum IBO Michael Berges all flew in as guest speakers for the special event. The audience was treated to hands-on leadership and opportunity trainings, in addition to special promotions. Gold IBO Dr. Michael Pounder, Platinum IBO Pastor Garth Sinnette and Platinum IBO Stanley Hoyte hosted two events in Trinidad with a combined attendee list of over 1,000 people! → Laminine TT is now open for distributors! → Be a distributor and have your information published in our Laminine Trinidad and Tobago microsite.